component mixtures in flue gas streams, evaluating the behavior of the materials at industrial conditions, and the impact that impurities have on the process. A first screen was done based on adsorption isotherms and isosteric heats of adsorption, calculated from Grand Canonical Monte Carlo simulations for pure components (CO2, N2, O2, H2O and SO2), binary and multi-component mixtures. Predicted selectivities were evaluated and complemented with breakthrough curves and working capacities for PSA/TSA processes among the different frameworks, with and without impurity traces. Results show that Mg-MOF-74 stands up as the most promising material to be used in PSA and TSA processes; however, considering its current availability to large scale and its cost, the zeolite 13X (NaX) still remains, at present, as a the preferred candidate for the industrial process (specially for VSA systems). This work highlights the use of molecular simulations for optimizing environmental related processes, focused on CO2 capture and separation. It provides new procedures to assess the use of these materials from their fundamental knowledge to their final implementation. Published Paper on soft-SAFT Modeling for aqueous solutions. Review and new insights into the application of molecular-based equations of state to water and aqueous solutions. The Paper "Review and new insights into the application of molecular-based equations of state to water and aqueous solutions" was published on "Fluid Phase Equilibria" on January 22st, 2016. Water is a fascinating compound, essential to our life and present in most of the biological and industrial systems. In spite of its importance, the particular features of water and the complex interactions formed when mixed with other compounds make most of the models developed up to date unable to accurately describe the phase and interfacial behavior of aqueous mixtures, unless a vast amount of experimental data are available to fit the model to particular conditions. As a consequence, several theoretical approaches have been developed over the years to reproduce the physics of water solutions with different degrees of success, depending on the underlying accuracy of the models. Among them, equations of state which explicitly account for hydrogen-bonding interactions, such as the Statistical Association Fluid Theory (SAFT) and similar approaches, are built to provide a better picture of water-systems behavior, although there is still room for improvement. With the occasion of the 25th anniversary of the SAFT creation, we summarize here some association theories developed in the last 25 years including the association term proposed by Wertheim. Given the vast amount of works published during these years, the review focuses on the application of SAFT equations, Cubic-plus-Association (CPA) and Group Contribution plus Association (GCA) to aqueous solutions of systems with large impact at the chemical and energy industry today: binary mixtures of water with hydrocarbons, CO2, alkanols, amines and ionic liquids. Different molecular models and approaches are revised in detail. In addition, we present new modeling data using the soft-SAFT equation, to highlight the advantages of explicitly including hydrogen bonds when building the equation, even if done at a coarse-grained level, and the remaining challenges and opportunities for improvement. The society and industry commitment to progressively reduce Green House Gases (GHGs) emissions forged important challenges that conventional gas separation processes are unable to overcome. 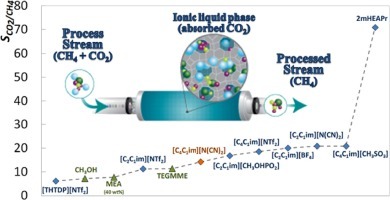 Ionic liquids (ILs) have been attracting an outstanding attention during the last decade as a promising class of viable solvents to capture pollutants and for gas separation processes. Being the IL-based membranes gas separation controlled by the gas solubility in the IL rather than by its diffusivity, the solubility of gases in ILs stands as highly relevant input for their application in liquid membranes. As part of a continuing effort to develop an IL based process for high pressure capture of GHGs, the phase equilibria of nitrous oxide (N2O), methane (CH4) and nitrogen (N2) were investigated in this work. Experimental gas–liquid equilibrium data for N2O, CH4 and N2 in [C4C1im][N(CN)2] were determined in the (293 to 363) K temperature range, for pressures up to 70 MPa and gas mole fractions up to 35 %. Unfavorable interactions towards the studied gases, with positive deviations to ideality, were observed for all the studied gases, placing the studied IL among those with the lowest selectivities reported. The observed behavior highlights that a delicate balance between the solvent polarity and its molar volume must be ascertained when a highly selective solvent for N2 or CH4 separation is envisaged. The soft-SAFT EoS successfully described the high pressure phase behavior data using the molecular model and parameters sets reported in previous works. A good description of the binary systems studied, including the small CH4 temperature dependency and the N2 reverse temperature dependency on the solubility were achieved using just one binary interaction parameter. This reinforces the use of soft-SAFT as an accurate model to describe the behavior of gases in ILs for different applications.